This Monday, September 26, 2011 marks the launch of www.trekkercomic.com, a new site which will feature weekly postings from the pages of Ron Randall’s classic, acclaimed sci-fi comic Trekker. 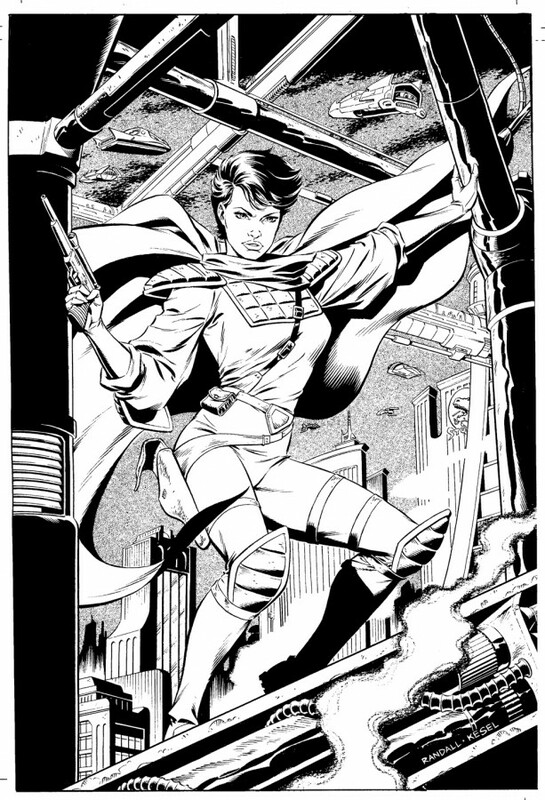 Randall, who is both writer and artist for the series, first created Trekker and its protagonist, Mercy St.Clair, for Dark Horse Comics during the rise of the independent publishing. Now he will also assume web publishing duties, beginning with the 8-page chapter that first introduced Trekker to the comics world. Each Monday will mark the posting of an installment from the Trekker archives, in chronological order of their original publication. Once all existing stories have posted, Randall will go on to post completely new, ongoingTrekker tales chronicling the life and times of Mercy St. Clair. Starting Monday, September 26, 2011 the new website www.trekkercomic.com will begin weekly postings of the character Ron Randall first created at Dark Horse Comics back in the days of the rise of the independent publishers. 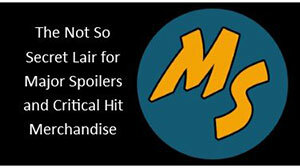 The website will open with a posting of the entire first 8-page chapter that introduced the character. 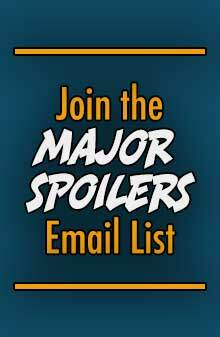 Each week new updates will continue to post fresh installments of all existing Trekker stories in the order they first appeared. Once all existing stories have posted, Randall will continue to post brand-new, ongoing Trekker tales, as he continues to follow the life and times of Mercy St. Clair. In 1986, Dark Horse invited Randall to create a series for them, and was given a creative free hand to come up with whatever he would most like to write and draw, and to have full ownership of the property. It was virtually an unheard of opportunity and, of course, Randall could not resist. Randall went about putting together the elements that most appealed to him, and came up with Trekker. Sure enough, the work Randall did on Trekker has always inspired the very best of his efforts. To this day Trekker remains the most personal and affectionately remembered work that Randall has produced in his long career. Trekker is the story of Mercy Ct. Clair, a brash, extraordinarily gifted young female bounty hunter living in the violent future of 2226. The strip follows Mercy’s life and personal “arc” as she pursues the hardened criminals that operate beyond the reach of an over-taxed law force. The existing stories open on the gritty, crumbling streets of New Gelaph, and gradually follow Mercy as she pursues the criminal element into the ruined lands beyond city lines. Ultimately Mercy’s journey will lead her out into the stars, where a restless humanity is striving for new hope. Randall hints that it’s on this grand stage that Mercy will discover her own surprising destiny. Until recently, the existing Trekker stories have only been fitfully collected for print—short stories in Dark Horse Presents, the original Dark Horse series, and in various “Special” single issues, and for years fans have clamored for a complete, accessible collection of Mercy’s adventures. 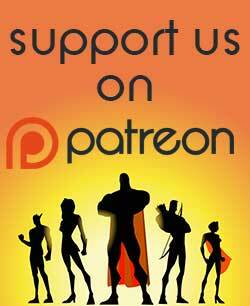 Trekkercomic.com aims to be exactly that definitive repository. Luckily for fans, Randall “clung faithfully onto every page of the original Trekker stories,” and so www.trekkercomic.com will feature fully-restored, high-quality images of the entire series. Stories that originally appeared in black and white will remain faithful to the original, but later color stories will be completely re-colored to take advantage of recent refinements in digital coloring technique. 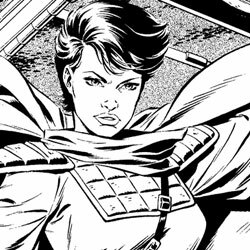 The site will also contain an exclusive “making of” image gallery containing never-before-seen Trekker-related designs, sketches and drawings. The continuing adventures of Mercy St. Clair will be open and fully accessible to readers at www.trekkercomic.com beginning on Monday, September 26.